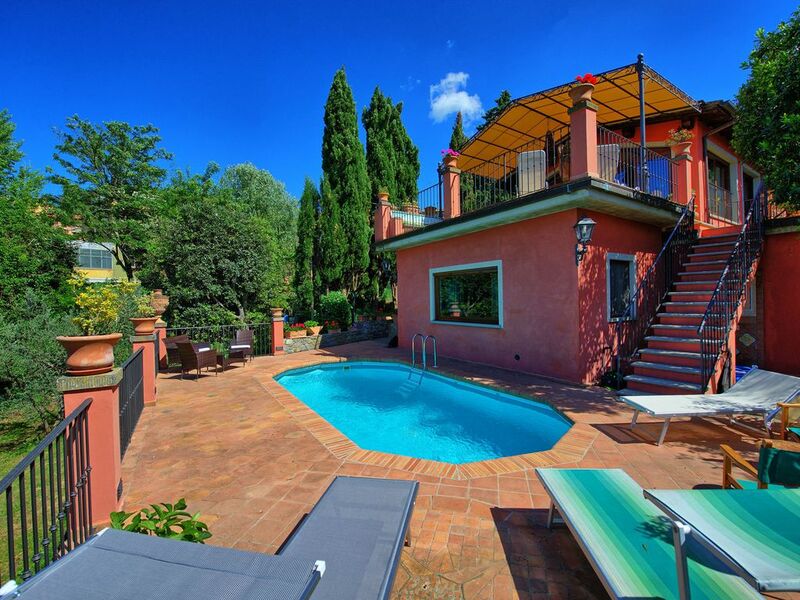 Beautiful welcoming independent villa with private pool situated in the small village of Donnini, only 29 km from Florence away. This house is tastefully furnished and decorated with beautiful frescoed walls. The outside areas provide a nice furnished terrace with gazebo and a beautiful private pool set in very panoramic location. The villa is situated right in the center of the village of Donnini but at the same time it guarantees its guests full privacy. Distances: Donnini with groceries 50 meters away, Tosi with bank and chemistry 4 km away, Sant’ Ellero with railway station (daily trains to Florence) 3,5 km away, Florence (airport) 29 km away, Arezzo 54 km, San Gimignano 85 km, Siena 100 km away, Lucca 120 km, Pisa (airport) 120 km away. At guests’ disposal: panoramic furnished terrace with nice gazebo, second terrace with private swimming-pool (7,6 x 3,8 m - min. depth 1,5 m – max. depth 1,5 m). Barbecue. Guests can have access to a small office with a computer and internet connection (free of charge). Extra Services: Baby bed available upon request (free of charge). Laundry with washing-machine and dryer available (€ 5,- / per washing and € 5,- / per drying). Ground floor: bright living-room with piano, satellite TV and access on to a panoramic terrace with gazebo, tables and chairs. 1 step higher: dining area with kitchen corner (oven, freezer, dishwasher, microwaves, toaster, American coffee maker). Basement (with access on to the outside): double bedroom with ensuite bathroom with bathtub and shower, double bedroom with ensuite bathroom with shower. Accessible only from the outside: one-bedroom apartment comprising a double bedroom open on to a living area with kitchen corner (oven, freezer) and dining table, bathroom with shower. Air conditioning is provided in all of the bedrooms and in the living-room. Huis was in orde. Prachtig zicht vanop het terras. Ligging: ideale ligging in het centrum van Donnini: bakker, kleine supermarkt, slager en krantenwinkel op wandelafstand. Nadeel: zwembad ligt aan de noord kant en daardoor is het water nogal koud. We hebben hiervan niet kunnen genieten.